Ukrainian President Petro Poroshenko has said that during talks with U.S. President Donald Tramp as part of the NATO summit in Brussels the sides spoke about the need to strengthen Ukraine's defense and improve cooperation, including in the defense sphere. "The [U.S.] president has given respective assignments on this issue. 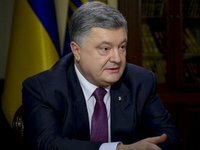 I will not disclose the details here, but we are developing very rapidly regarding the provision of consultative, advisory assistance from the United States, because this is mutually beneficial cooperation," he said in an interview with Ukrainian television channels released on Friday. According to Poroshenko, the leaders of the states also discussed energy security. "Here we agreed on absolutely common positions and approaches. The United States supports Ukraine in positions regarding Nord Stream 2 and considers it unacceptable, because this project is political, undermines Europe's economic, energy and global security. The president spoke out very decisively in support of Ukraine and in support of energy security," he said. At the same time, he added that he had raised the issue of releasing hostages and "asked for it to be raised at a meeting [between Trump and Russian President Vladimir Putin] that will be held in Helsinki on Monday." Poroshenko said that the next meeting between the Ukrainian and U.S. leaders had also been discussed. "Of course, we discussed our next meeting. We exchanged views, and I can say that I am very pleased with this meeting," he added.